West Maui is a great place to take up residence on your next trip to Hawaii. Perfect shorelines make way for great beaches where the fun never ends. Whether you want to lounge in the sand or take surf lessons West Maui is perfect for you. With a wide variety of condo and home rentals, complete with a variety of amenities and features, your home away from home awaits. Browse and book your West Maui vacation rental today! Beautiful Hidden Gem in West Maui. This is the best kept secret on Maui ! This beautiful ocean view will make you feel as if you are on the deck of a cruise ship. 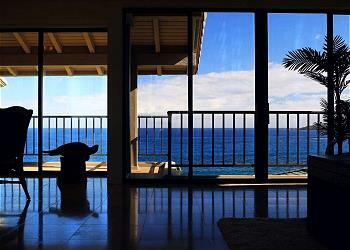 Feel the cool trade winds brushing over you as you enjoy the views of Molokai and Lanai. Our lovely home offers a spacious living room, dining area and private lanai with views of the outer islands. The breathtaking colors of the nightly sunsets you never imagined existed, can be found right on your lanai. 1 bedroom (king) and 1 bath (shower & tub) direct oceanfront condo with sofa bed, if needed. Featuring panoramic oceanfront views of the blue Pacific. Fully stocked kitchen, washer/dryer in suite and central A/C. Our spacious, Air-Conditioned studio, sleeps 2-4 has a cal-king size bed and full size sofa sleeper, a full kitchen, bathroom with separate vanity, washer and dryer, Sectional Sofa with a 55 inch Flat screen TV and Free broadband and wi-fi internet.